Have you been travelling here? Rate it! Phuket is one of the most popular beach holiday destinations of South East Asia. This stunning island has everything to offer: super beaches, ancient temples, 5 star hotels, tropical jungles to explore, and famous thai food to sample. 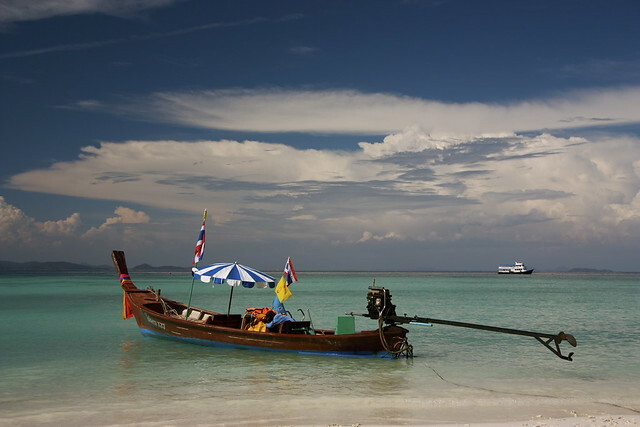 Phuket also offers great scuba diving and is a great base to explore all of what the Andaman Sea has to offer. From there, you can reach the best dive sites of Koh Phi Phi, Ko Lanta and the world famous dive site Richelieu Rock. Phuket is a starting point of many liveaboards cruising to the world class diving destination of Similan Islands and Surin Islands. The Island is very famous for its nightlife especially in Patong Beach. Every night crowds of tourists come to party hard until dawn. Phuket town: in the centre of the island with no beach but provides the cheapest accommodation. Chalong Bay is a popular yacht anchorage and the gateway to other islands. Laguna Beach, long and quiet beautiful beaches and perfect spot to watch the sunset. Patong Beach, the place to be for nightlife and many beach resorts. Phuket has a lot to offer but the Island is VERY touristy and if you don’t like the tourist crowd and wanting to relax, you’re better off staying in other places like Ko Phi Phi or Ko Lanta islands. I usually use this website to book in advance my hotels in Phuket as they usually have the lowest rates I find. I like it because it's free to cancel and change the dates. You will find all types of accommodation on Phuket Island. There are luxurious beach resorts, 5 stars hotels and amazing villa and houses to rent. There is also plenty of cheap accommodation and basic guesthouses, mostly in Phuket town. Prices tend to increase during the high season from November to May and especially during the peak season in December and January. It is better to book in advance during this period. During the rest of the year, it is possible to bargain the room rates and you can get a nice hotel for cheap. All the excursions can be arranged by your local diving resort or your hotel. There are also numerous small travel agencies that can arrange for you any day trip you want. The rainy season runs from May to December. From June to October, there is heavy rainfall but rainy days are rare and it is mostly a cooling 2 hour downpour at the end of the day. The dry and hot season runs from January to April is the best time to visit Phuket. Even if it is the dry season, there still can be rain. The high tourist season runs from November to April with a peak in December and January. It is best to avoid this period as accommodation is often full and prices tend to increase sharply! If you are planning an upcoming dive trip or travelling to Phuket, it is a really good idea to invest in travel insurance for scuba diving, because you never know what could happen and when you might need it (because accidents do happen!). I recommend this diving insurance as they offer worldwide coverage and focus on providing scuba divers a quality insurance and medical assistance service. Where is Phuket located in the world? 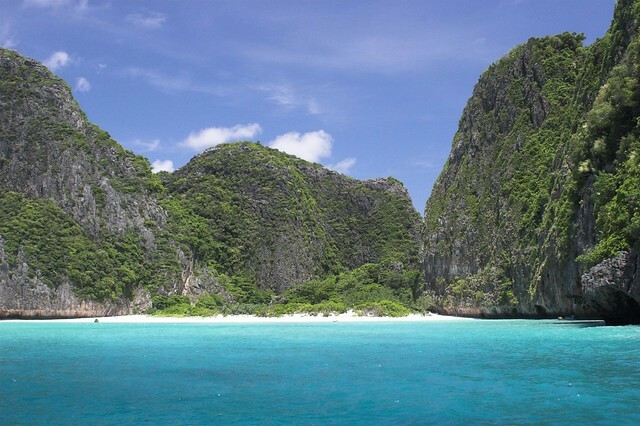 Phuket is located on the South West coast of Thailand not far from the Islands of Koh Phi Phi and Koh Lanta. Phuket is a major tourist destination which is well connected and can be reached easily. Flying to Phuket is the easiest and fastest way to get there. Phuket has its own International airport. You can find flights from just about everywhere in the world! Airfares are mostly cheap and you can fly easily from the South East Asian cities of Bangkok, Kuala Lumpur in Malaysia, Singapore, Bali and Jakarta in Indonesia or Hong Kong. The most well-known and reliable airlines within Thailand are Air Asia, Thai Airways and Bangkok airways. During the high season you can also find a direct charter flight from Europe and Australia. The International airport is located about 40km from Patong Beach where most accommodation is situated. By taxi it will take you 45 minutes and cost around US$ 20. You can also share a minivan, door to door service or take the public bus. It is also possible to rent a car. From Bangkok, there are daily buses heading to Phuket. The journey is quite long about 12 hours but generally cheaper than the plane. Better to take a night bus. Be careful of your belongings as many travellers have reported thefts. Along with the bus, you also have daily trains leaving from Bangkok. Travel time is about 12 hours too. Train can be a good local way of transportation and you will see super landscapes of lush tropical jungle during your trip. Trains are not direct and should get off at Phun Phin railway station and take for 5 hours a bus to reach Phuket. You can go to Phuket from Koh Phi Phi and Krabi by ferry. Phuket is the largest Island of Thailand and is actually quite large. For example, driving from the North to the South of the island takes about 1.5hrs. The best way to get around Phuket is by Tuk-Tuk which is basically a mini taxi. The fare has to be bargained hard before the ride. It will cost you from US$ 2 to US$ 15 depending on where you want to go. It is also possible to charter the taxi for several hours. There are numerous motorbike taxis. These are very useful and cheap for short trips but not very comfortable for long distances. There is also public transportation but the schedules are often not very reliable. You can rent a car or a jeep (1000 baht/day) at Phuket airport and in some places around the main cities and beaches. Scooter and small motorbikes can be rented (200 baht/day, less if for a long period) at many places in the tourist areas. It is a cheap convenient way to get around but be careful of erratic drivers and the apparent lack of road rules. Always ask for a helmet. You also need an International driving licence, otherwise police can fine you. Although, if possible avoid driving at night; due to the island’s party reputation, you could run the risk of drunk drivers on the road. You can charter a longtail local boat to go exploring nearby islands. Price is about 1,800 baht a day. Access to the best diving areas of the Andaman Sea and starting point of many liveaboards to Similans and Surin Islands! Good place for cheap diving courses. Have you been travelling or backpacking in Phuket? Please consider sharing your experience by leaving a comment below! Some inspiration for your Travel Comment: How did you get there, How did you travel around, Which Hotels did you use, Did you have a good time? Your email address will not be published. Divezone has complete information about scuba diving and snorkelling in Phuket. For information about the best time to dive, list of fishes spotted in these waters, please check our Phuket Diving Review.